Imagine you were an aerospace supplier to giants of the industry like Airbus and Boeing. Now imagine you could reduce your lead times on the parts you produce by 95 per cent, hugely increasing your throughput and, ultimately, your profitability. Thanks to 3D printing, that vision has become a reality for French aircraft design and manufacturing company Latécoère, which is harnessing the power of Stratasys technology to enhance rapid prototyping and production tooling workflows. The installation of a Stratasys Fortus 450mc has transformed Latécoère’s business, which previously used CNC machining for prototyping parts that would take weeks at a time for a single design iteration. 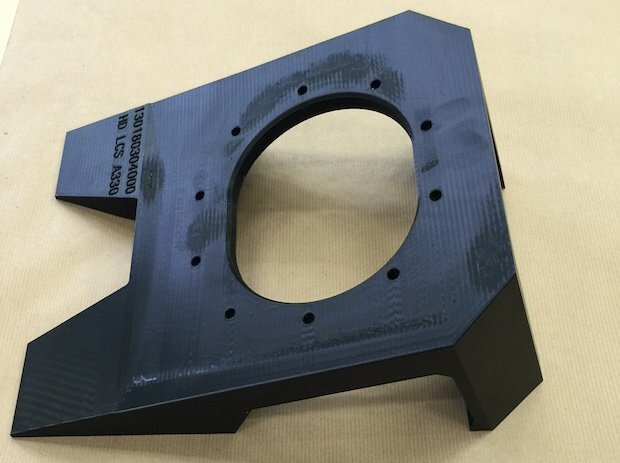 The latest in a long line of businesses in the aerospace manufacturing sector to benefit from an investment in additive manufacturing, it recently produced a 3D-printed prototype to verify the fit and function on an interior lining part for an aircraft door, taking two days – a 95 per cent reduction in lead time. It also printed a camera case prototype for the Airbus A380 aircraft, to validate the design of the product which would house the camera’s internal parts. Traditionally that would have meant an aluminium model for testing but, thanks to the Fortus 450mc and industry compliant ULTEM 9085 material, prototypes were not only produced more cost-effectively but were 50 per cent lighter than their metal counterparts. The fact the company has taken to manufacturing customised production tools on-demand with the Stratasys machine, saving time and money and contributing to an improved service, is the icing on an impressive cake. Simon Rheu, Composite and Additive Manufacturing Manager at the Latécoère R&D and Innovation Centre, said: “Additive manufacturing has integrated seamlessly into our design and production process, and has seen us enjoy improved lead times, reduced costs and enhanced operational efficiency. “As the requirements of the aerospace industry become more demanding we’re also mindful of the need to maintain our competitive edge, and Stratasys additive manufacturing enables us to meet that objective. “Using metal sheet manufacturing, creating a tool can take up to six weeks. Now we can 3D print a tool in just two days and 50 per cent lighter using ULTEM 9085. With our 3D printer we can also optimise the geometry of the tool to perfectly fit the part, making the operator’s job much easier. SYS Systems is the Stratasys platinum partner in the UK, with more than a decade’s expertise in supplying, installing and servicing the full range of its world-leading products. Andy Middleton, General Manager of Stratasys Europe, Middle East and Africa (EMEA), said: “Latécoère, like many of our aerospace customers, is benefiting from our proven technology and high-performance materials for this industry.